With Olark live-chat app integration, you can stay connected with your customers via real time chat. Once you have installed and configured the integration, the live chat will be available on your customer support portal where your customers can interact with your agents. Communicate with your customers in real time. Automatically convert chat transcripts to support tickets. Convert offline chat messages to support tickets. Go to https://www.olark.com/settings/code and login with your Olark account to get your Site ID. Go to Admin click on on the Integrations option. Click on Marketplace and install Olark live chat app. Once the app has been installed, enter your Olark Site ID from earlier and click on the Save Changes button. Select the Email Settings option. Keep a note of your support email address under the Global Mailboxes. 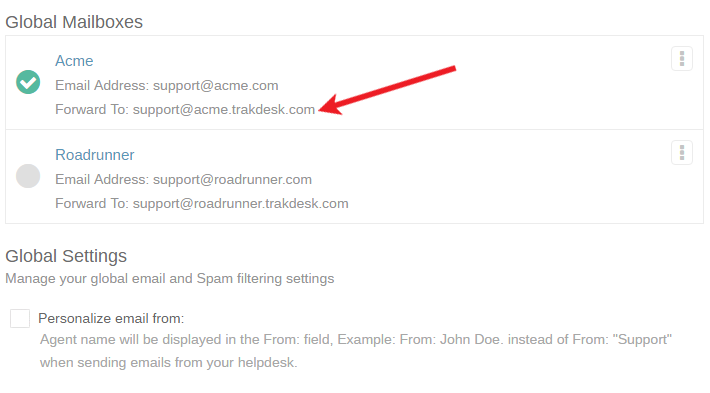 We will use this email address later on to convert chat transcripts into support tickets. Login to Olark with your account. Enter your support email address from earlier and select the Forward all transcripts option. That is all. Olark live-chat integration is setup and configured.